An fast 1-&GT;9 and I got a wallaby or two. 1:30 One of my quickest times. Good night Hal and Wolf and all who follow. Everybody!! Smoke? Yep, still heavy. Good afternoon - Wolf, Hal, Rage, Tom, & Denny; nite-nite, Anne...….. In honor of Thanksgiving, I have resurrected my over-stuffed bat. I have been working on Wombat's poozle. There are some rather obscure answers in there. My brain is fried. You've outdone yourself this week, Wombat! Morning all,that was a fast puzzle. Vici must have a way with animals, they all seem to pose for her. I sent my answers to Wombat last night, Kathy. It sure was a tricky one. Vici for the cute Wallaby photo. By the way, what's the difference between a Wallaby, and a kangaroo? 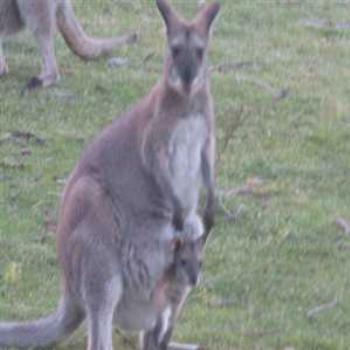 Jacalmi, There are in fact a number of kangaroos and large number of Wallabies. I'm not an expert, but the most obvious is size, the grey and red kangaroos being the largest, but then there are rat kangaroos which are quite small. I hope an expert can give a more definitive answer. Hi Viv, great to see you visiting. 1:01, couldn't quite make it! Good morning everyone. Back home again ... apparently just in time. The prevailing winds made the smoke from the Camp fire more dense in San Francisco than at home. That stayed the same for the trip back. Odd thing: Joyce's URL did not work, but when I found the same site using Google, it was the same URL as in Joyce's comment. What if, indeed! If only! The most striking difference is their size. While a kangaroo can reach a towering two meters, their more petite relatives range from between 30 cm to just one meter. I’m here at the concert ! Sarah, Joyce's link didn't work because there's a stray space just before the-heart. Remove the space and it works just fine. Yes, Joyce, I listened, hence my comment about what if: If only! And thanks, Saltie, for pointing out the extra space. I missed it before trying it, while trying it, and then when comparing the two URLs! Sarah for the explanation on the Kangaroo and Wallaby question. Also to Wombat. I liked Peter's answer as well.